Many charity Facebook pages now feature a ‘donate’ button. By using this, you can contribute funds to causes you support, such as the Great North Air Ambulance Service. Whether you’re celebrating a special occasion such as a birthday or an anniversary, asking for donations in lieu of presents is a great way to support a cause you care about. By supporting the Great North Air Ambulance on Facebook, you are helping save the lives of people day after day. Fill in your fundraising target and when you would like the fundraiser to end. Now you can share your fundraiser with your friends and family on Facebook. They can donate in just a few clicks, without leaving Facebook. Click here to create your own fundraiser. Facebook does not take any cut from the donations that you raise, which means all your donations will go toward our lifesaving mission. Gift Aid increases your donation by 25%, without costing you any money. If you choose to Gift Aid your donation, you will be asked to provide your address details. How do I know you have received my donation? When you donate, Facebook will send a receipt to the primary email on your Facebook account. The Great North Air Ambulance Service receives Facebook donations every two weeks. We also receive a report, so we can see how many donations have been given. This report includes your name and donation amount, but we don’t receive any contact details, unless you choose to share them. 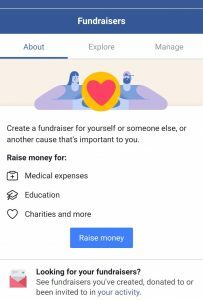 This means if you fundraise for an event through Facebook, such as the Great North Run, you will need to let us know, or we won’t be able to count it toward your total. If you have any questions about donating to the Great North Air Ambulance Service through Facebook, please get in touch.